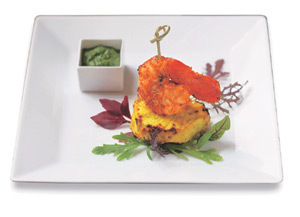 You don’t want to visit an Indian restaurant in London?” My friend, chef Vivek Singh of Cinnamon Club, was incredulous. “That’s plain bizarre! Everyone knows that the best Indian food on the planet is in London.” It was my turn to be shocked. The whole point of visiting a new city in another country is to sample the local food. But Singh’s outrage was palpable. And since he’s not one to indulge in high-pitched rhetoric, I knew I’d have to take his claim seriously. First on my list was Sitaaray. In Drury Lane, the heart of the theatre district in London’s Covent Garden, it is an Old World Hospitality project—one of the few Indian restaurant companies outside five-star hotels to have operations on another continent. Taking a cab on a Saturday night is guaranteed to remind you of rush hour in an Indian city: Traffic comes to a grinding halt as tens of thousands of theatre-goers pour out of venues from Piccadilly Circus all the way to Covent Garden. I got to my 9.30 pm reservation largely by praying fervently and paying off the cab a kilometre from my destination and sprinting the rest of the way. 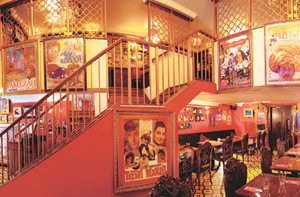 Sitaaray, a whimsical take on the Mumbai film industry, had red walls covered from floor to ceiling with film posters and photographs of stars. Aishwarya Rai Bachchan had come visiting, loved the look of the place (and presumably the food, too) and signed a photograph. I didn’t think the restaurant had an ethnic feel to it, but the others that I was to visit over the course of the next week had no ethnic stamp at all. The kebabs came in generous portions. You choose whether you want vegetarian or non-vegetarian kebabs, and go through something like nine varieties of them, an assortment of breads, pulao, raita and dal. I was fully prepared not to like it: It was the first time I was eating Indian food outside the country. But I was in for a surprise. The cuts of meat and varieties of seafood were streets ahead of anything we get here. Also, inexplicably, the spices had a flavour and strength that you simply don’t find in India, and that is what lifted the experience out of the ordinary. Next on my list was Amaya, about which I had heard rave reviews. Apparently, it didn’t have the look and feel of an Indian restaurant. And they were right—it didn’t. On the way in, I counted four Mercedes-Benz cars parked outside the restaurant—a factor of its being located in Belgravia, London’s millionaires row. My dining companion and I ordered oysters with moilee sauce to start with, and I must say I was blown away by the concept. Moilee in Kerala is usually preceded by the word meen because the coconut milk-based pale yellow gravy usually goes with fish. So it was a surprise, and a classy one at that, to pair it with fresh oysters on the shell. The food in Amaya ranged from dishes that were barely identifiable as Indian in provenance to those that were more traditional than nouvelle. Most of the appetizers had been given an Amaya twist; all the main courses were Indian classics with nary a tweak. Only one dish fell a little flat: the dora kebab. According to the grapevine, it was the star of the show. But the British just couldn’t get the point of a kebab made of mince so fine that you didn’t need teeth to eat it. The result was that it was the least ordered dish on the menu, and Cruella de Ville, our server, wagged her finger at us and, in a piquant reversal of roles, demanded to know if we knew what dora kebab was. Cruella, you see, was British. Sadly, the kebab was a pale imitation of the original. 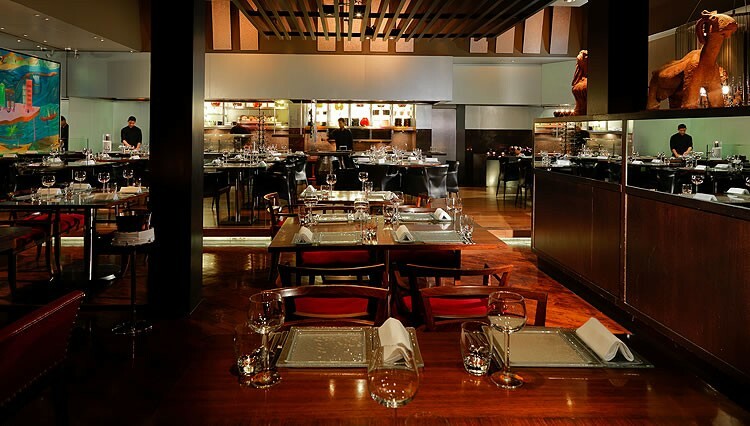 Amaya was the only Michelin-starred Indian restaurant that I visited on my trip. I wished Cruella had been a mite more pleasant and had changed our plates between appetizers and main courses—then I would truly have been in raptures. Cinnamon Club has no Michelin stars. But though it makes little attempt at adornment, it still can’t help looking a trifle grand—it is, after all, the old Westminster library. Cinnamon Club’s claim to fame is its ability to maintain a fine balance between the seemingly irreconcilable objectives of modern and Indian. My tandoori loin of Cumbrian mutton with Hyderabadi salan had been cooked rare on request. You’d never get that quality of lamb in India nor that particular cut, but the salan, full of crushed peanuts, til (sesame) and a hint of sourness, was pure Hyderabad. The fillet of Wagyu beef with stir-fried morels and saffron sauce was far less Indian—it was saved from being an out and out Western preparation by the smidgen of spices that lurked in the sauce. The lassi panna cotta with tamarind glazed strawberries was a more equitable blend of East and West. My only regret is that I couldn’t visit a Bangladeshi restaurant. Ever since I’d got my hands on the takeaway menu for Acchar Indian Cuisine—a Bangladeshi eatery that made a distinction between chicken tikka joypuri, chicken tikka rongdonu and chicken tikka moricha—I had been captivated. But the standard I had set for myself was that any Bangladeshi eatery I walked into had to be at least half full. But not one that I passed by had as much as a table occupied at the time.